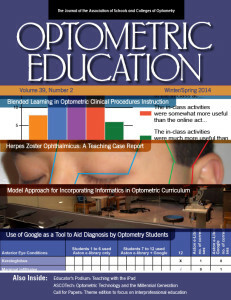 Optometric Education is announcing a future theme edition, which will focus on all aspects of interprofessional education. The deadline to submit articles for this theme edition is Aug. 30, 2014. For additional information on the theme edition contact Dr. Aurora Denial at deniala@neco.edu. The Association of Schools and Colleges of Optometry (ASCO) and The Vision Care Institute, LLC, an affiliate of Johnson & Johnson Vision Care, Inc., are pleased to announce the offering of the 2014 Educational Starter Grants. The grants have been offered over the past three years and are dedicated to supporting educational research. This is a great opportunity for faculty to get involved in doing educational research, which can impact teaching, student learning and the profession. Information about the grants, past successful grant proposals and the current application can be found on the ASCO website at http://www.opted.org/grant-and-award-opportunities/.